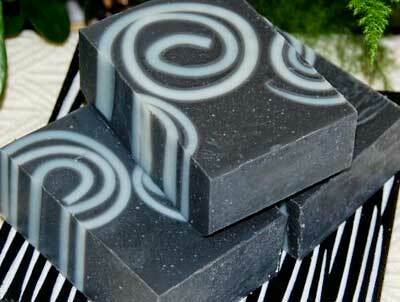 Here's a handmade soap recipe specifically made for those who adore the scent of black licorice. Sambuca Rose contains Anise and Sweet Fennel essential oils along with a hint of spice, citrus, and rose for that added twist. If you want a little less licorice and a bit more 'twist' try reducing the Anise and Sweet Fennel to 1/4 teaspoon each and increasing the rose scent to 5 teaspoons. This recipe contains palm oil. Should you prefer to make it palm free, simply replace the palm oil with your favourite hard oil such as shea butter, cocoa butter, mango butter, lard or tallow and run the recipe through a lye calculator to obtain the correct amount of sodium hydroxide (lye) needed. Distilled Water - 179 gr. | 6.31 oz. Coconut Milk - 100 gr. | 3.53 oz. Lye - 127.05 gr. | 4.48 oz. If you wish to make this homemade soap recipe look like the one pictured above you, will need to make a batch of the Basic Homemade Soap and when it is finished insulating, follow the directions for creating soap curls. Once your mould is filled with the soap curls, you can make the soap base following the instructions for your preferred soap making method on the "How to make soap" page. Mix until the soap reaches a thin trace and then add the coconut milk, orris root powder, mica, black oxide and the scent. Blend well. Stick blend until a medium trace is reached and gently pour the soap base into the prepared soap mould. Depending on how many soap curls you have used, you may have excess soap base...be sure to have a second soap mould ready to pour the extra soap base into.